Strong the force is in this one! 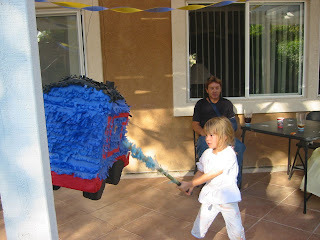 While Jason struggled to understand the pinata, Anna used her Jedi mind tricks to trick the pinata into giving up its secrets. 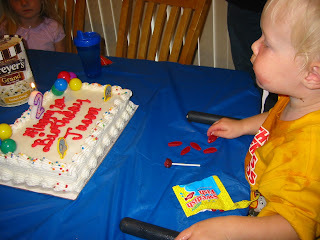 "Mmm . . .Release the candy, you will"
Jason's 2nd Birthday party was (surprise!) 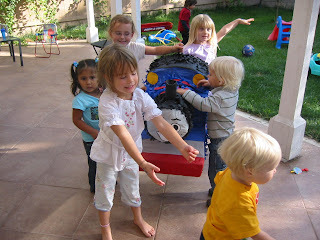 a train theme. There were about 20 people at the party. Cake, ice cream and a SoCal necessary . 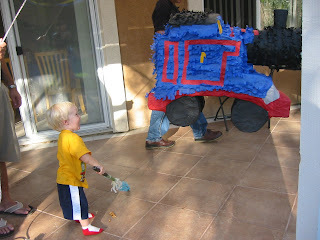 . . a pinata, Thomas the Train. You can see how big it was in the third photo. 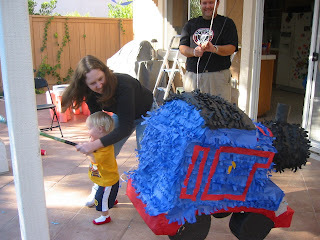 Really, the kids could have climbed on top and rode it around in the yard. 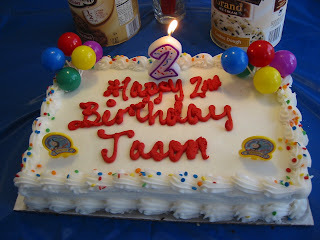 Jason took a little while, a points from Mom to warm up. But, in the end he did his best. To answer all of you who asked . . .yes, I am still going to deploy for 7 months to Iraq, sometime in late winter (that is all of the detail I can give you right now). The recent "draw down" doesn't effect the 130,000 regular people already there! I will not be deploying with my 1st Medical Battalion Corpsmen (mostly Navy), but instead with a large Battalion of Devil Dogs (ie Marines). I will be one of the few Navy people and the only Naval Officer in the Battalion. Anyway, I will let you know !